Black Ice Software - BiBatchConverter version 4.11 is released! BiBatchConverter version 4.11 is released! Added Windows Service base document conversion! Black Ice Software has released the BiBatchConverter version 4.11 including the new BiBatchConverter Service Manager utility to provide an automated batch printing solution running as a Windows service with easy-to-use user interface. The Service Manager allows users to interact and configure the BiBatchConverter Service which converts the documents silently in the background. 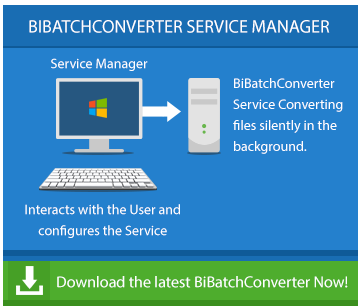 The Service Manager is now part of the BiBatchConverter, and it installs automatically along with the BiBatchConverter. The BiBatchConverter service can also run under an "Administrator" account instead of under a particular user or System Account. This allows the BiBatchConverter service to continue the document conversion even after the current user logs off in unattended mode. The new BiBatchConverter Service also uses the Auto-print module for converting and processing documents, therefore it supports the same file formats as the BiBatchConverter, including MS Word, Excel, PowerPoint, RTF, Visio, PDF, TIFF, FAX, PNG, JPEG, BMP, Text, XPS and more file formats. Version 4.11 of BiBatchConverter also includes a new MSI Installations designed to greatly simplify large scale deployment. The new BiBatchConverter MSI Installations are now fully customizable through a custom INI file to allow Administrators to completely preconfigure the BiBatchConverter for all users. For MSI installer availability, please contact sales@blackice.com. Converts document types: Word, Excel, PowerPoint, Visio, PDF, TIFF, XPS, HTML, RTF, Text and more. For more information about the Service Manager, please refer to the Service Manager webpage. Download the Latest Impact BiBatchConverter!